Dimensions: 15" x 18" + 3"
Dimensions: 20" x 20" + 5"
Fitted with a reinforced handle, Patch Handle Merchandise bags are the ideal shopping bag for customer use! 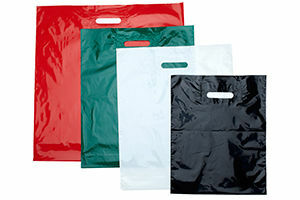 With a 5 mil reinforced plastic patch added in the handle area, these plastic merchandise bags are strong and durable. Patch Handle Merchandise bags are perfect for gift shops, bookstores, craft shops and other retail locations!Use this merchandise bag to carry jewelry, clothing apparel, gifts and more! We offer Patch Handle Merchandise bags in 3 sizes and 6 different colors. Patch handle bags are packaged 500 bags per case, except 20" x 20" + 5" which come 250 per case. For customizing options, or to speak to a Product Expert, please contact American Retail Supply at 1-800-426-5708.